This confluence forms part of an eleven-confluence journey that starts at 27°S 150°E. After a pleasant drive into to Quambone, we took the road to Coonamble and then turned off on to a station called “Tara”. The homestead was a kilometre or two from the road and I popped into to seek permission to go confluence hunting on their property. About half-a-dozen people were relaxing in an above-ground swimming pool and they directed me to the owner who was doing some gardening nearby. I spoke with this gentleman for a few minutes and he went into his office and pulled out a giant laminated aerial photo which proved most useful in identifying potentially useful tracks. The land here was extremely dry, soft and dusty due to the drought, and it certainly wouldn’t have been possible to get anywhere near the confluence without a four wheel drive. 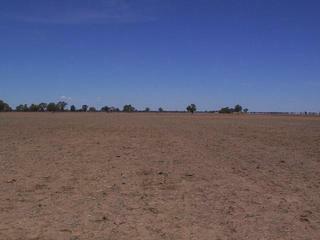 Sadly, virtually every paddock was empty as there simply isn’t enough food or water to carry significant numbers of livestock at the moment. The only livestock we saw were a couple of dozen cows in a shaded area near a bore that were being hand fed. We got ourselves to within about 50 metres of the confluence in the car. It was now mid-afternoon and extremely hot, so Ada and the kids stayed in the car while I quickly jumped the fence and took my photos. This was the last confluence for this trip on which I bagged 9 out of the 11 planned confluences. We now have a couple of days in Dubbo before driving home to Melbourne on New Years Eve. Ellie Walker plans to visit this confluence between the 23-Oct-2006 and the 23-Nov-2035. Comments: "I'm planning a trip north soon. I have a good compass and accurate maps as far as the Central Mapping Authority have produced. I'm finding out what else I need...any help would be appreciated. Would like to visit this confluence...I'll keep you posted on "